Please read each product description carefully. These supplemental units are aligned to Benchmark Advance. If you are looking for something that has exact Benchmark wording DO NOT purchase this product. Check out the quality of my work on Facebook or Instagram. Administrators must contact me primarymadnesswithmrsgenna@gmail.com to purchase the correct license. 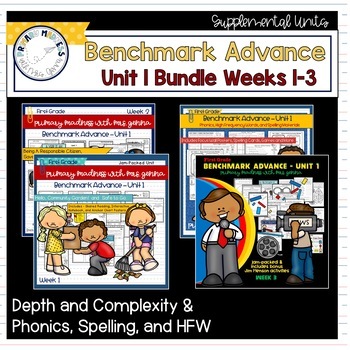 This product contains the Phonics, Spelling, and HFW Unit AND Depth and Complexity Units for weeks 1-3. **This product is created by a current first grade teacher teaching CA 2017 Benchmark Advance First Grade with extensive experience in this grade. Activities are written in first grade friendly language. In purchasing this you are agreeing to these terms. This purchase provides one license per teacher and is intended for single classroom use. Colleagues must buy their own copy or you may purchase the additional licenses. Licenses are NOT transferrable. It shall NOT be distributed by purchasing individuals, teachers, by any school administrator, school district, internet (in any form) and additional licenses are required. You many not claim these as your own or resell my units. Each unit is different with a different number of pages. Please read details carefully. If you have a question please email me at primarymadnesswithmrsgenna@gmail.com or ask under “ask a question” I would love to help clarify anything for you. All items are clearly labeled. Due to the nature of instant downloads I generally do not give refunds.